OMG Posters! » Archive Stella Im Hultberg Art Print Set - OMG Posters! Gallery 1988 released another great mini print set, this time by Stella Im Hultberg. 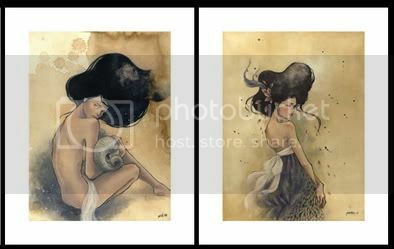 The set comes with four 4″ x 5″ giclees, plus 50 sets come with a chase print, and 25 sets come with an original drawing. The edition is 500, the price is $80. To purchase, give G1988 a call at (323) 937-7088. 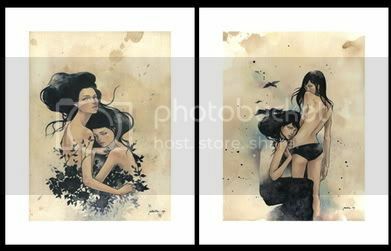 So does Audrey Kawasaki copy this style or do they copy her style? Honestly, Audrey and Stella are night and day. Although they both frequently choose to use females in their artwork, there is a massive difference once their vision hits the canvas/wood, Tool. Regardless, they both do amazing work. well as long as there’s some dang scantily clad super young hotties im down! woo-hoo! Does anyone know if I can purchase anything by Stella in Australia??? I am having a lot of trouble coming across anything for purchase any where in the world. Can anyone give me some ideas on websites etc that I could check out?? ?